"Cantwell was neither a great writer nor speaker, yet he did both well whenever he made the attempt. His specialty was spade work. He often comes to my mind when I listen to the excuses of those who think they cannot be useful without genius. The arranging of meetings, distribution of hand bills and the hundred and one things incident to the revolutionary movement, where hard knocks and privation prevail, without the compensating advantages of glory or notoriety were his speciality". obituary of Cantwell by Harry Kelly, Mother Earth February 1907. Tom Cantwell was born on the Pentonville Road in London on the 14th December 1864, the son of a map-mounter’s clerk. He worked first as a basket-maker and then as a compositor. It was while he was working as a basket-maker that he probably joined the Socialist League in 1886. It was there that he learned the basics of the compositor’s trade. He signed a notice of the North London branch and served on the committee to organise the Whit Monday outing. At this time he was living in Holloway. In February 1887 he served on the committee to prepare for the commemoration of the Paris Commune. He became a lecture secretary, served on the SL executive, and worked hard as a lecturer and propagandist. He had become an anarchist by at least 1887 which is indicated by a lecture he gave entitled “No Master”. That year he spoke with John Turner, Sam Mainwaring and H.B. Samuels at an anti-Jubilee meeting in Hyde Park. He played the part of the foreman of the jury in William Morris’s play The Tables Turned put on in the SL hall in 1887. He lectured at the Berner Street Club in the East End in 1888 on sweated basket-makers and was particularly critical of the Parcel Post department’s behaviour in its contracts for basket-making. On the evening of May 1st 1891 he was a speaker on the Mile End Waste alongside David Nicoll, Yanovsky, Charles Mowbray and Arnold. The large crowds were mainly made up of dockers and other riverside workers. In attendance was a large force of police, both foot and mounted. With the repression brought down on the movement by the Walsall affair in 1892 the Commonweal offices were raided. According to David Nicoll the Special Branch officers were told by Cantwell in jest that “We have been expecting you for some time, and do you think we should be fools as to keep anything here likely to get men into trouble”. This was contradicted by W. C. Hart in his highly sensational book Confessions of An Anarchist who says that a book – The Emancipator - which was an explosives manual being prepared by the provocateur Coulon had its type already made up. According to Hart Cantwell “ accidentally” dropped the formes of type during the raid. However this is contradicted by Inspector Melville, one of the police officers supervising the raid who was to construe Cantwell’s sarcastic comment as an admission of guilt but fails to mention the dropping of type formes. Cantwell was one of the speakers who spoke at the protest meeting on Sunday April 24th at Hyde Park. A large crowd were amused by his imitation of the Scotland Yard inspectors Littlechild and Melville who had told him that they were anarchists. He was one of those who restarted the Commonweal in May 1893 alongside John Turner, Carl Quinn, Ernest Young , Joseph Presburg and H.B. Samuels. On 5th December of the same year he wrote to the Chief Commissioner of Police on behalf of the Commonweal Anarchist Group Publicity Committee giving notice of a meeting to be held in Trafalgar Square “for the purpose of obtaining a condemnation of your actions in suppressing Anarchist opinions and misrepresenting Anarchist principles”. He had received no intimation on the expected conduct of the police and wanted to know “if you adhere to the claptrap in which you indulged about a fortnight ago”. The letter was minuted as to be ignored and that no meeting would be allowed subject to a decision by the Secretary of State. Cantwell was described as a militant Anarchist who had been connected with The Commonweal for some time. In 1893 Cantwell produced the last issues of the original series of The Commonweal as well as the new series during 1893-4 - with only the six month break when he was imprisoned. He started printing it from 27th May 1893 at 4 Sidmouth Mews. On 29th June he and Ernest Young were arrested for flyposting a poster about the wedding of the Duke of York. The poster advertised an indignation meeting to be held in Hyde Park on 2nd July to protest against the “waste of wealth” expended on “these Royal Vermin”. Apparently Cantwell was behind the idea of the poster and of meetings around the theme. The case was finally dismissed, both Cantwell and Young remaining in prison until the trial, though the owner of the hoarding fined them both. In 1894 Cantwell published an edition of Mikhail Bakunin’s God and the State with a postscript from Max Nettlau. On 29th June 1894 he and Carl Quinn addressed a meeting at the new Tower Bridge which was to be opened the following day by members of the royal family and politicians. They wanted to appeal to the workers who had built it and Cantwell had printed a placard which read : “Fellow workers, you have expended life, energy and skill in building this bridge. Now comes the royal vermin and rascally officials in pomp and splendour to claim the credit. You are taken to the workhouse and a pauper’s grave to glorify these lazy swine who live upon our labour”. The reaction to the two anarchists speech was violent. There were many professional anti-socialist hecklers around this speaking pitch, many of them retired soldiers. A mob of 400-500 attacked the anarchists, surrounding Cantwell and shouting “lynch him”, whilst others attempted to strike him with large pieces of wood. For this the police arrested Cantwell for disorderly conduct! As John Quail says “ being pursued by people who were trying to hit him with large pieces of wood obviously amounted to disorderly conduct”. Quinn managed to escape but was arrested the following day when he went to the police station “to see fair play for Cantwell”. They were kept in prison for a month during various court appearances. Their subsequent trial was something of a travesty. The meeting had been like many previous ones, with no charges brought by the police but this time the charges were incitement to murder members of the royal family, seditious libel on the royal family, and two other incitements to terrorism, all rather flimsy. The judge showed much bias towards the defence. The police were doing what they could to get Cantwell and Quinn sent down, part of the ongoing State campaign against anarchism that had began with the attacks on free speech in Manchester in 1893. Despite many defence witnesses - including William Morris who declared as a character witness that Cantwell was “a good-natured man, perhaps rather rash” - the two anarchists received six months imprisonment with hard labour. In the period after his release he was also involved in the publication of the anarchist paper The Torch which was set up by the well brought up young ladies Olivia and Helen Rossetti and their brother William. However Cantwell’s habits and character became sources of irritation for the rest of the group. The Rossetti sisters in their fictionalised account of the London anarchist movement of the time, A Girl Among the Anarchists, were to write in a derogatory fashion about Cantwell (disguised as Short in the novel). 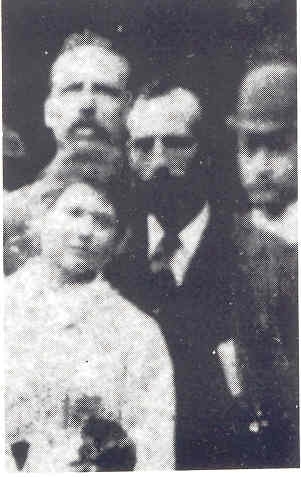 Geoffrey Byrne, another member of the group was to state that the Rossettis were driven away from the movement because of Cantwell’s behaviour, although there may well have been other reasons for their departure ( see Oliver p.124). In spring 1895 Cantwell was invited by Alfred Marsh to join the Freedom Group together with John Turner and Joseph Presburg to “reinforce” the ranks and to relieve William Wess who was seeking other employment. With occasional interruptions, when other people were available, Cantwell was in charge of the Freedom printing office from 1895-1902. Harry Kelly, an American anarchist who had moved to England, wrote that “Cantwell and I were the only simon-pure workingmen in the group”. However Cantwell had become difficult. It may be speculated that his imprisonment had affected both his physical and mental health. Harry Kelly was to remark that "he had never quite recovered from the six months hard labour". He threatened the Italian anarchists Pietro Gori and Edoardo Milano with a gun and appears to have tried to dictate editorial policy to Marsh. In April 1895 the printing of Freedom was re-started at Judd Street in Kings Cross, in a small building described as a “glass house”. In April 1896 Cantwell moved with all the print type to 127 Ossulston Street in Somerstown. The printshop there was known as the Cosmopolitan Printery until 1902. In the next year all other anarchist papers closed down. From September 1898 A Belgian, F. Henneghien was able to replace Cantwell and this was a relief to many as he tended to fall out with comrades on a regular basis and was seen as very unreliable rarely producing anything on time. As regards Freedom George Cores noted that Cantwell “ had, as acting editor, a peculiar habit of censoring all contributions, making everything which appeared conform to the gospel according to Cantwell. This did not suit the comrades”. Marsh himself was to write in 1897 to Nettlau that “ you cannot imagine what a time I had. 2 ½ years with Cantwell is enough to kill anyone” (Cantwell had left Freedom in November, at least temporarily). He was again responsible for the printing of Freedom after Henneghien left in 1900. Cantwell had a heart complaint from at least 1894 and he was soon to have a stroke. Cherkesov found him on Christmas Day 1902 with his head lying in the “ashes of the fireplace all but dead. He recovered and lived several years after but was never able to work and was never again the same man”. Apparently he had continuing heart trouble after the stroke. Freedom published an appeal for him in 1903 saying that he was “overtaken by a long and trying illness". He died on December 29th 1906. He was buried at Edmonton Cemetery on 3rd January 1907, his funeral being attended by William Wess, Tom Keell, and Frank Kitz, among others. Max Nettlau in a tribute to him wrote of his unfailing attendance of meetings, his regular publication of Commonweal after 1892 despite great difficulties and his night activities when he flyposted on prohibited hoardings. Despite his many faults Cantwell had a long record of activism and remained loyal to his ideas until the end, unlike, say, Olivia Rossetti who ended as a sympathiser of Italian fascism and devout Catholic. He was still able to win the affection of an anonymous member of the Freedom Group who wrote :" We shall all miss poor T.C., in spite of his many crochets" and Harry Kelly was to remember his old comrade with the final comment: "Farewell, Tom Cantwell! It was worth while meeting you". Becker, Heiner. Notes on Freedom and the Freedom Press 1896-1986. Raven 1. Freedom Press. Cores, George. Personal recollections of the anarchist past. Kate Sharpley Library. Meredith, Isabel (Helen and Olivia Rossetti) A girl among the anarchists. University of Nebraska Press. Quail, John. The slow burning fuse. Paladin. Old Bailey Proceedings, 23rd July 1894. Photograph from the Raven 1.